The definitive source of data for the recorded music market during 2018. An annual report available in PDF and hard copy with optional Excel tables containing a wealth of detailed data. The Global Music Report 2019: Data and Analysis was published on 2nd April 2019. It contains a detailed assessment of the recorded music industry for the full year 2018. The report features extensive and authoritative data for the global industry and across more than fifty individual markets. Not all information listed is available for every country. Contact ritco@ifpi.org if you have a query on which data points are available for a specific country. Three levels of packages are available: Premium, Recorded Music Industry *, and Academic **. Recorded Music Industry and Academic packages are only available to certain organisations. The table below outlines what is available in each package. * Package only available to buyers from the Recorded Music Industry (an entity whose primary activity is the creation / production / publishing of music recordings). This package will not be delivered automatically after purchase but only following verification of status which will be at IFPI’s discretion. ** Package only available to buyers from academic institutions (eg libraries or research institutions). This package will not be delivered automatically after purchase but only following verification of status which will be at IFPI’s discretion. Full pricing details are available in this pricing guide. Or, use the calculator on the right-hand side to select the cost of your preferred package. UK VAT will be added to prices where applicable. Any external use of data or material from the Data and Analysis section of the IFPI Global Music Report 2019 requires an External Use Licence for which a fee is ordinarily payable. This licence covers the terms under which data or material from the Data and Analysis section of the IFPI Global Music Report 2019 can be used in items such as reports, publications, or presentations which go outside your organisation. The External Use Licence covers activities such as citing data or material from the Data and Analysis section in external reports, publications, or presentations; using the data in derivative works (for instance, building a forecasting model) which are then used externally; or using the data or material when providing services to third parties, such as in databases and dashboards. The External Use Licence covers the material and data in the Data and Analysis section of the IFPI Global Music Report 2019, the Excel add on spreadsheets, and the Powerpoint summary. 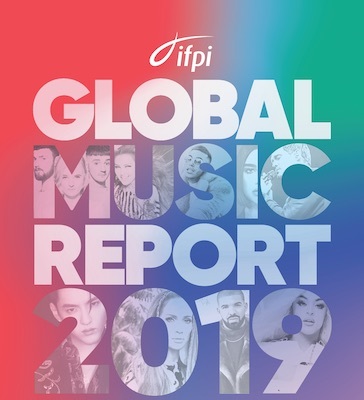 For further details on the usage of the content within the Global Music Report 2019, please get in touch at ritco-licensing@ifpi.org.